FORMER Danish Railways (DSB) ‘NoHAB’ diesel MY 1125 is now in use with private operator Kárpát Vasút in Hungary, numbered as 459 021. The same operator has a second ex-Danish MY loco – No. 459 022 (ex-MY 1156). The Danish MY design was based on the classic EMD ‘F’ unit and used the EMD567 engine. Fifty-nine of the A1A-A1A MY design were built between 1954 and 1965. All were withdrawn from DSB service by 1992, but most still exist with private freight or maintenance contractors, the majority in Sweden and Germany. NoHAB also built 45 lower-powered but visually similar type MX locos for DSB between 1960 and 1962. All of these are now withdrawn from DSB use, and like the MYs some remain in use with private operators in Denmark and Sweden. Similar locos were built by NoHAB for Norwegian operator NSB (Class Di3), one of which was used as a demonstrator in Hungary in 1960. This loco – Di3 623 – is preserved in Hungary by the NoHAB Foundation preservation group. 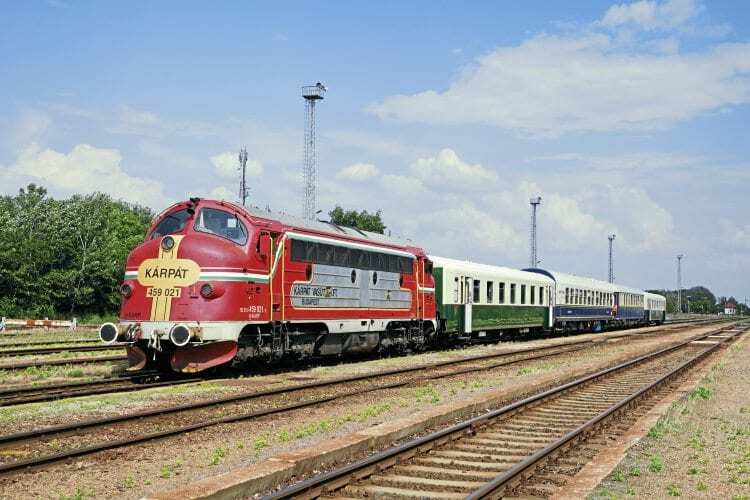 Hungarian Railways (MAV) bought 20 similar Class M61 diesel locos from NoHAB following the demonstrator tour. They were delivered in 1963/64 by train ferry to Sassnitz in East Germany and then by rail. All were withdrawn by 2000, although seven survive in preservation or in use with private freight operators.